in Santa Fe, New Mexico on April 22, 1998. Archives of American Art, Smithsonian Institution. 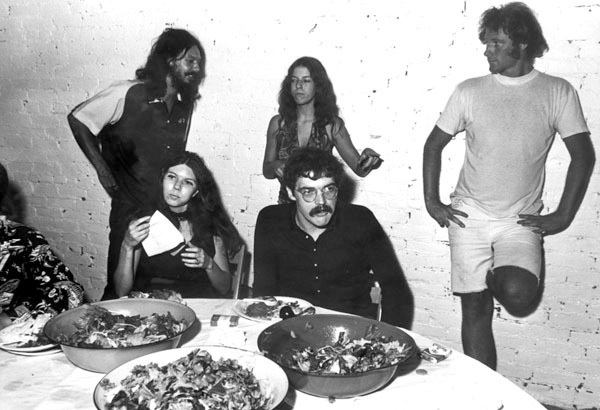 Jo Harvey and Terry Allen (seated), with Al Ruppersberg, Debbie Taylor and Gary Kruger at Cirrus Editions, 1970. All images courtesy of Terry Allen and L.A. Louver, Venice, CA. PAUL KARLSTROM: You, of course, went to Chouinard in L.A., and that’s an important part of your story. I know a little bit about the program at Chouinard but basically, it wasn’t an academic program, it was much more straight art school. Isn’t that right? TERRY ALLEN: Yeah, we had academic classes two hours in the morning, like from 8:00 until 10:00, we had English. The school had just been accredited so they had to bring in different academic teachers. But it was really geared to artists. In retrospect, it was a huge door for me to walk in because it was the first time I ever got really excited about those kind of ideas—literature. I was a secret reader and kind of a closet reader in West Texas because I think any male especially, you just didn’t read. You played ball or you did, you know, overtly physical things. Reading was always sissy, or it had some kind of connotation that was negative usually. And this was pretty common I think during the ‘50s in isolated rural areas. Chouinard was the first place that I encountered like-minded, like-situated people, people that, for whatever reason or pretense, felt like outcasts from their own culture. PK: Well, it sounds like this was a very important experience for you then, going to Chouinard and perhaps recognizing expanded possibilities, how you might fit in or sort of an avenue you might pursue. TA: At Chouinard, the first day. He came from Cleveland, and we have been very close friends since those times. We began talking about the same thing, about the permission that school gave you. And also coming up against the various walls that are inevitable with that kind of permission, you know, the responsibility that goes with it and so forth. 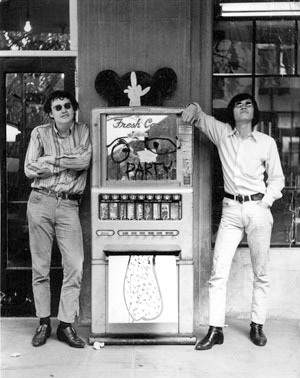 Terry Allen (left) and Gary Wong at Chouinard Art Institute, 1966. I had done one semester at Texas Tech and failed everything; everything except an art class and an English class. I did find out about Chouinard in this art class because I was so desperate by that point to get out of Lubbock and get out of Texas and get out of my life, period. I asked this teacher if there was any place that you could go to school that the whole school experience would be like his drawing class, you know. And he said, “Yeah, I went two years to this place out in Los Angeles called Chouinard Art Institute.” So I wrote them, got an application, which was hilarious. The application was, like, draw your hand, draw your pet, draw your room, you know, make up a drawing out of your own imagination. And then you had a number of questions like, who do you think is the most important artist of the 20th century? I put Norman Rockwell because I had never heard of any other artist, you know. That was the only visual artist, except, I mean, thinking back, the artists that were really…had impacts on me were tattoo artists who I didn’t know and comic book artists. But before rock and roll came along, it was comic books that caused juvenile delinquency and all those kind of problems. And the tattoo thing came from— All of my mother’s brothers were in the navy and merchant marines, so they were very heavily tattooed, and I can remember as a child sitting in the yard when they’d be drinking beer and tracing the different tattoos that they had on, you know, and loving it, you know, just loving looking at them. PK: Was Llyn Foulkes around yet? He was, wasn’t he? TA: Llyn was older than me and I knew Llyn— I’d seen his band, but I never really crossed tracks much with Llyn. It’s funny. That was one interesting thing about LA is that there were so many different communities. It wasn’t like the art community in, say, New York or San Francisco even. I remember when Al did a piece called Al’s Café. He set up this café where he sold artwork, plates of art rather than food. And he’d have stuff like BLT, which would be a plate full of branches, leaves, and twigs, stuff like that. But it was the first time that I can remember in LA— This was, like, 1967, I guess, at the café he did. It was the first time I met artists from Venice, from the San Fernando Valley, from Pasadena. I was living in Silver Lake and Hollywood and kind of around— In there is where Jo Harvey and I were living. I had heard about these guys, you’d see work periodically, but it was the first time I’d ever really met them. I think it was one of the first times, as a group, those people met each other. TA: It was called Al’s Café. PK: That sounds great. Tell me more about that. Now, I don’t know anything about that. TA: It was off of Alvarado Street, very close to Chouinard. It was next to a halfway house for guys just coming out of the pen, and he rented this place for a month, and he did a huge kind of installation down in the basement area, then upstairs was a café. LACMA has the whole collection of his plates and a lot of people bought that stuff, but it was like the first kind of real active environmental work that I can remember. I had done a 45, the first record I ever did, which was called “Going to California.” And the flip side of this 45 was called “Color Book,” which was kind of a zany idiot song that I had written, and this friend of mine paid for one thousand copies of my record to be made. But there was a guy floating around LA at that time called the Hollywood arsonist and he was lighting different fires all over Sunset Boulevard, and he literally lit one of his fires on my stack of freshly pressed records. Terry Allen, 1969. Photo: Gary Kruger. PK: When was that? What year? TA: Sixty-seven. Then he did a piece called Al’s Grand Hotel, which was in conjunction with the “Art and Technology” show at LACMA. It was a house on Sunset Boulevard that each room was an environment. PK: Yeah, I’ve heard about that. TA: I played the opening of that. There was a sound truck that came in, and I recorded all of that stuff. PK: That’s fascinating. I was around then. TA: He’s a guy you should talk to. PK: Where does he live? TA: Well, he lives where he gets mail pretty much. TA: He’s an extraordinary person as far as talking about the history of that period of time. And a wonderful artist. Al and I had a co-op gallery we called Gallery 66, and at the time, Walter Hopps was at the old Pasadena museum; he was the director. We would visit Walter because he liked to shoot the breeze with art students, and whenever we’d have a show, we’d call Walter and tell him to come down and look at it, and he would always do it. He would call about midnight and say, I’ll meet you there at 3 a.m. It was literally like some kind of spy scene: Walter would come in through the back door, his overcoat with a collar up so nobody would see him, kind of whisk through the show, and then leave. Next time we saw him, he would deliver his comments. 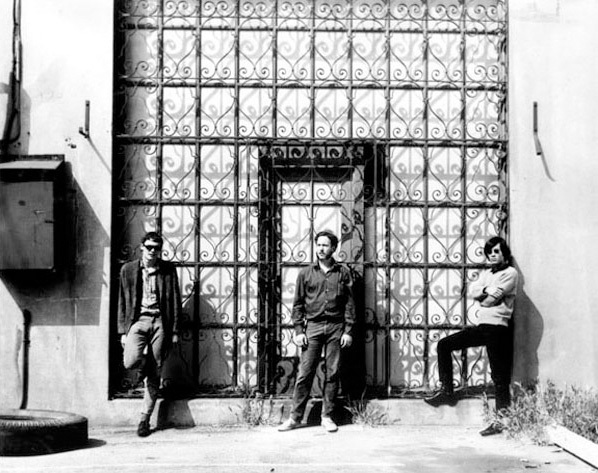 Terry Allen (left) with Patrick Cooper and Gary Wong at Gallery 66, Pasadena, 1966. Then he moved onto wherever he went to after that, and I believe it was Jim Demetrion who was acting director after that. I had done a body of work, the first body of work after I got out of school, and I decided to take it to galleries, which were nearly all along La Cienega during that time. I went to Nick Wilder’s gallery. I kind of decided that I should go to the galleries and show people that I like. So I went to Nick’s, laid all my drawings out on the floor, and he took about three hours with me, just telling me about different galleries, his ideas about them, what was going on, where I should take my work, and where I shouldn’t. He said, “I really like these drawings, but I’m not interested in showing them. I’m not interested in this kind of work for my gallery, but I do like them and think you should go to so-and-so, whatever.” He said the one person I should avoid is Irving Blum, totally—who’s right across the street from Nick. So I picked up my drawings and walked right across the street to Irving’s gallery, told the receptionist I would like to speak to Irving. I was ushered in; he was on the telephone. He kind of motioned for me to spread my drawings out on the floor like I had done at Nick’s. He got up, put the phone down, never said a word, looked at all of the drawings very carefully, went back to the phone, called Demetrion, said there’s a guy here you’ve gotta show, give a show at the museum. So my first show was at the Pasadena Art Museum. PK: Thanks to Irving Blum. PK: What were the drawings like at that stage? This was just after art school, or were you still at Chouinard? TA: Well, after I went out of school, I went through that dead zone I think a lot of people do of just not working. I taught— I fell into a job through the U.S. Poverty Program and taught the third grade for a year in Watts. Sixty-seven, right after I got out of school, and I didn’t do any work during that period of time. I had reached that point where I was very much in debt. I had student loans. I was on scholarship my last two years in school, but I still took out loans just to live and then the band— I had all of the equipment in my car and it was all ripped off, so I owed everybody in the band. This was just several weeks before I would graduate, and I can remember walking out with this sheet of paper, Jo Harvey and I walking out after this hilarious graduation ceremony at Chouinard into the street and looking at this and realizing this wasn’t even toilet paper. What am I going to do now? I’m out of school, so that’s over with, now what? And I think that’s the killing for a lot of people in art school. There are a lot of art students, but it’s that first year when you come into the reality that you’ve got to make a living and step into the world. TA: Yeah. But anyway, I think it was that withdrawal from the sanctity or the womb, of mama, of school. There was a friend of mine that had a studio above a movie theater, and they let him have the studio for free for changing the marquee twice a week. I remember going up to visit him, and he had these drawings that he had been working on, and I just thought, I’ve got to start working. So I decided for nothing better to do, Well, I’m going to illustrate the Bible; I’ll just start there. I did maybe up through Deuteronomy before they started changing and becoming something else, and they were very comic book kind of oriented. I also started thinking about music, how I could somehow—because I was always writing songs and constantly playing music—how I could incorporate music into these drawings. So I started doing drawings with tapes on the back. I would record a tape, and if you bought the drawing, you got this tape, kind of the soundtrack to it. The songs didn’t, in any way, illustrate the drawing or vice versa. They were like two parts of the same thing. But it was a struggle to put music into the visual thing and vice versa. That was a need that I felt very early on but not in school. In school, I was desperately trying to be an Abstract Expressionist, which is what they were teaching. TA: I did have a great teacher, though, Emerson Woelffer. He was great because he said nothing. That’s why he was so great. He would walk up to something that you had done and just start rabidly gesturing and kind of grunting at it and then walk off. He was a wonderful person. And then Ruscha would come around once in a while; Joe Goode would come around once in a while. Irwin taught there off and on. They were older, and they were just starting to kind of do their stuff. PK: Would they come and teach or just hang out? TA: They would come and talk, just talk, but a lot of times, they’d just come and hang out. That’s what was pretty unique about Chouinard. The first term that I was there, I had an art history class with a wonderful woman named Ms. Watson. I don’t know her first name, but she had been a nun in France. She was an American but had been cloistered in France and somehow, while she was over there, had met André Breton. She dropped the cloth and ended up in LA working for the old Herald Examiner as an art critic. And like most of the people that taught academic classes in Chouinard, she did it to pick up some extra money in the mornings. I’ll never forget the day she just said, “Well, today, we’re going to talk about a French artist, Mr. Marcel Duchamp, and we’re fortunate enough to have Mr. Duchamp with us today so you can quiz him and talk to him afterward.” So Duchamp was there in the class; he was doing his first exhibition out with Walter at Pasadena, and he invited the entire class to go to the museum because we had been so nice to him. Well, but having no clue whatsoever who Marcel Duchamp was, or what he was, and just thinking he was this kind of quirky old French cat, but he did invite us out to the museum to observe this interview he did, and we were sitting in the French windows and then walked around and looked at all of what to each of us at that time was this extremely bizarre work. This is what Ms. Watson did. Harry Callahan, the photographer, was a good friend of hers. Whenever he came through, he hung out. Man Ray had his LACMA show, and he would come just about every day to lunch and sit out with the students at the picnic tables and talk. TA: So that was kind of like a perk that happened at Chouinard, just by the nature of the people that were in and out of there. And again, I don’t think anybody that was there at that time registered at all how interesting that was, and it was something that happens in your memory. I’ve always thought that you think you’re learning something at a particular time, you’re focused on something and you think you’re learning, and it’s not until maybe six months or a week or a year later that you realize you were learning something totally different.